We can carry out repairs on virtually any make and model of car or light commercial vehicle. We will provide a full estimate for all repairs and keep you informed of the vehicle’s progress. You are welcome to wait in our reception area while we carry out the repairs or leave your vehicle with us. We can also take you home or collect your vehicle from your home with our free collection and delivery service (local to Guildford), ask our friendly team today! If you need a car repair service in Guildford please visit or call our Guildford garage on 01483 560 251. Bellfields Autos can assist with servicing and repairs for most makes and models and as independent specialists we can help save you a lot of money compared to mainstream dealers. If you are looking for an independent garage in Guildford then contact us for all your servicing and repairs. We specialise in most makes and models and use only experienced mechanics. Bellfields provides labour, parts and accessories at competitive rates and can save you money when compared to mainstream dealers. Some of the manufacturers we specialise in include: BMW, Audi, Volkswagen, Honda and Nissan. Call 01483 560 251 for more information on having your car repaired with us. 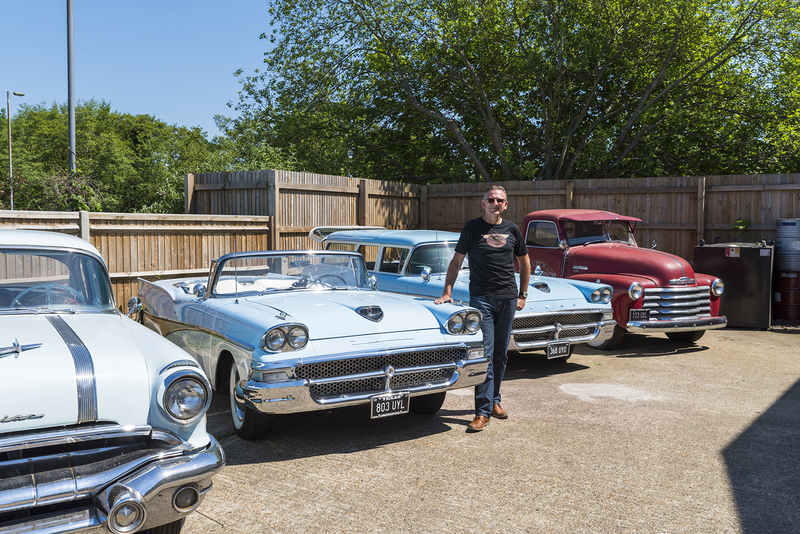 Philip, the owner of Bellfields Auto Services has a real passion for classic cars and owns 1950 Chevrolet truck and a collection of classic and American cars. We can MOT and carry out all repairs on most American and classic vehicles (repair parts permitting), giving them the care and attention they deserve. All vehicle’s that are over 40 years old no longer require an MOT, however it is still the owners responsibility to keep that vehicle in a roadworthy condition. We offer a classic car condition check, which is similar to an MOT, for only £29.95 + VAT. We will check your vehicle’s condition for the road and give you peace of mind on its condition. We will even show you how we check certain areas so you can DIY in the future if you wish to! If you are a classic car owner and have any questions, please ask and we will help and advise as much as we can. Find out more on our classic car servicing page.